Can Sports Help Young People Heal From Trauma? If your organization is creating a healthier community through sport, learn about the RWJF Sports Award. Boston-based organization Doc Wayne, a 2015 Sports Award Winner, uses sports to transform the lives of youth suffering from trauma and its emotional aftermath. When I describe the harrowing circumstances of the youth I work with to reporters, philanthropists, family and friends, they can’t believe that I’m describing the lives of young people in America. Many of these youth have endured deeply traumatic experiences: crime, abuse, incarceration, domestic or community violence, addiction and even sexual exploitation. Often, they don’t want to talk about the issues they’ve faced—or they don’t know how to. Yet when you put a ball in their hands, they suddenly light up! Erin D. Maughan, PhD, MS, RN, APHN-BC, is director of research at the National Association of School Nurses and a Robert Wood Johnson Foundation (RWJF) Executive Nurse Fellow (2013 Cohort). If we want to create a Culture of Health in America, a 2015 priority must be to focus on ways to break down the barriers that separate us and keep us from being as effective and efficient as possible. Currently, health care systems, education, housing, and public health work in siloes; they are funded in siloes, and workers are trained in siloes. Yet, people’s concerns and lives are not siloed and a community health culture/system cannot be either. One of the places to begin coordinated cultural change is in schools. Schools are a smart choice to target because nearly 98 percent of school-age children, in their formative years, attend school and schools provide access to families and neighborhood communities. The Department of Education’s Full-Service Community Schools Program and Whole School, Whole Child, Whole Community Initiative reminds us that, in order for children to be educated, they need to be healthy and there must be a connection between school and community. There are many school health initiatives in place, such as healthy food choices, physical fitness, healthy policies, school health services, community support, and after-school programs. The potential is there—but so are the siloes. But when schools are appropriately staffed with school nurses, the nurses help break down the siloes; that is because school nurses are extensions of health care, education, and public health and thus can provide or coordinate efforts to ensure a holistic, resource efficient, healthy school community. Steven J. Palazzo, PhD, MN, RN, CNE, is an assistant professor in the College of Nursing at Seattle University, and a Robert Wood Johnson Foundation (RWJF) Nurse Faculty Scholar (2013 – 2016. ) His research focuses on evaluating the effectiveness of the Teen Take Heart program in mitigating cardiovascular risk factors in at-risk high school students. Difficult problems demand innovative solutions. Teen Take Heart (TTH) is a program I’ve worked to develop, in partnership with The Hope Heart Institute and with support from the RWJF Nurse Faulty Scholars Program, to address locally a problem we face nationally: an alarming increase in obesity and other modifiable cardiovascular risk factors among teenagers. The problem is substantial and costly in both economic and human terms. We developed TTH as a solution that could, if it proves effective in trials that begin this fall in my native Washington state, be translated to communities across the country. The State of Obesity: Better Policies for a Healthier America, released recently by the Trust for America’s Health and RWJF, makes it clear that as a nation we are not winning the battle on obesity. The report reveals that a staggering 31.8 percent of children in the United States are overweight or obese and only 25 percent get the recommended 60 minutes of daily physical activity. The report also finds that only 5 percent of school districts nationwide have a wellness program that meets the physical education time requirement. What Protects Our Children from the Effects of Stress? Lorraine McKelvey, PhD, is an associate professor of family and preventive medicine and pediatrics at the University of Arkansas for Medical Sciences. She is an alumna of the Robert Wood Johnson Foundation (RWJF) New Connections program (2008-2009) whose work focuses on vulnerable populations. For children, stress can come from sources inside and outside the family. It was recently documented that nearly two out of every three children in the United States have witnessed or been victims of violence in their homes, schools, or communities. That’s a staggering statistic when we consider the well-established link between children’s exposure to stress and their long-term mental and physical health outcomes. Indeed, we know that early exposure to adverse experiences can change the way that our brains develop and function. We also know that exposure to adversity increases the likelihood that children will develop psychosocial problems, like depression, aggression, and other antisocial behaviors. There is even evidence that exposure to stressors in childhood increases the likelihood of having heart disease and cancer in adulthood! We’re seeing signs of promise in the effort to reverse the childhood obesity epidemic in the United States. Overall childhood obesity rates have leveled off—and they’ve even declined in some regions and among some age groups. To make more progress, Lavizzo-Mourey says, we need more people and organizations in the fight—particularly the business community. So what more can be done? On Thursday, May 8, Lavizzo-Mourey and influential leaders from throughout the nation—including many from the business community—met to consider innovative approaches in a forum, “Closing the Gap in Childhood Obesity,” sponsored by RWJF and the Clinton Health Matters Initiative, in collaboration with Grantmakers in Health. The forum focused on developing solutions to the inequities that exist in childhood health and childhood obesity. Read Lavizzo-Mourey’s complete LinkedIn post. Watch an archived version of the forum webcast. Adam L. Sharp, MD, MS is an emergency physician and recent University of Michigan Robert Wood Johnson Foundation Clinical Scholar (2011-2013). He works for Kaiser Permanente Southern California in the Research and Evaluation Department performing acute care health services and implementation research. Violence is a leading cause of death and injury in adolescents. Recent studies show effective interventions can prevent violent behavior in youth seen in the Emergency Department (ED). Adoption of this type of preventive care has not been broadly implemented in EDs, however, and cost concerns frequently create barriers to utilization of these types of best practices. Understanding the costs associated with preventive services will allow for wise stewardship over limited health care resources. In a recent publication in Pediatrics, "Cost Analysis of Youth Violence Prevention," colleagues and I predict that it costs just $17.06 to prevent an incident of youth violence. The violence prevention intervention is a computer-assisted program using motivational interviewing techniques delivered by a trained social worker. The intervention takes about 30 minutes to perform and was evaluated within an urban ED for youth who screened positive for past year violence and alcohol abuse. The outcomes assessed were violence consequences (i.e., trouble at school because of fighting, family/friends suggested you stop fighting, arguments with family/friends because of fighting, felt cannot control fighting, trouble getting along with family/friends because of your fighting), peer victimization (i.e., hit or punched by someone, had a knife/gun used against them), and severe peer aggression (i.e., hit or punched someone, used a knife/gun against someone). The Alameda County Public Health Department's EMS Corps program is supported by the Robert Wood Johnson Foundation. When he was 17, Dexter Harris was good at two things: football and hustling. Although he went to school, he spent most of his time trying to earn money. He wasn’t thinking about his future. He was thinking about surviving the here and now. Instead of finishing his senior year, Dexter found himself in a California juvenile facility. There, he met a mentor named Mike who told Dexter about a new program, EMS Corps, that offered far more than emergency medical training (EMT) classes. EMS Corps also provided tutoring, mentoring and leadership classes, and was looking for people from the community who were willing and ready to serve in the emergency services field. After hearing about EMS Corps, something changed for Dexter. He weighed his options and saw that with EMS Corps he could actually have the chance for a different life. Dexter threw himself into studying, and eventually graduated first in his EMS Corps class. 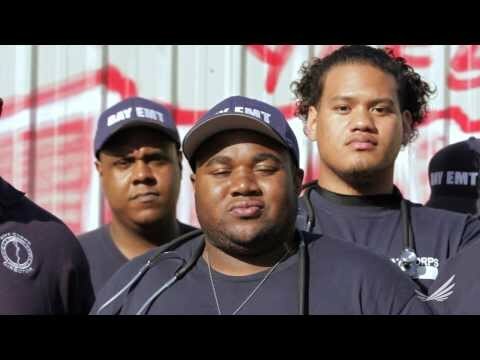 As a certified EMT, Dexter now has a career with Paramedics Plus and returns to the juvenile facility to teach other young people about being a First Responder. In every community there are young men like Dexter who have the potential to succeed. But like most young people, they need help and support to bring out their best. Today, I was honored to be present at the White House as President Obama helped to add more momentum to a growing movement to expand opportunity for young men of color. I was joined by leaders from both the public and private sector committing their intellect, creativity, passion and resources to continue to identify solutions for men and boys of color. I was inspired by the continuing and new energy to ensure that every young man has the opportunity make healthy choices and has the tools to live a healthy life. That includes skills to succeed in school and work. EMS Corps is just one bright light among the many innovative and inspiring approaches that the Robert Wood Johnson Foundation has been proud to support as part of its effort to create a culture of health and opportunity for all young people. This new national initiative announced at the White House brings a new chance to build upon this exciting and important work. It’s not just EMS Corps. Look at our Forward Promise partners to see the richness of programs already lifting up young men. It’s not just the White House and our Foundation colleagues in this movement either. There are thousands of teachers, police chiefs, state and local legislators, judges, church leaders, and community based organizations from across the country that are taking steps to ensure that all young people in America, including our young men of color, have the opportunity to succeed. If our job is to build a culture of health for all young men, then those collective efforts are its vital building blocks. As I arrived at the White House this afternoon, I couldn’t help but think of Dexter. And of all of the “Dexters” who will benefit from this unprecedented moment of commitment to hope, change, and opportunity for our sons, brothers, students and neighbors. I’m proud to be a part of the Robert Wood Johnson Foundation and of this larger movement. Together we can bring out the best in our young men. And they—in achieving their promise—can bring out the best in all of us. The EMS Corps program helps local health care providers expand and diversify their workforce by training young men and women from the community to be emergency medical professionals. The program also gives young people mentoring and life coaching to help them become healthy, responsible adults. Students receive intensive classroom training, including life mentoring. It's not just book study. EMS Corps training can give students a second chance at life. Training in an emergency care setting helps prepare students for the day when they will be working on their own during ambulance calls. Students receive hands-on patient care training. Learning to keep careful, detailed records of an ambulance call is an important part of EMT training. An EMT assesses a patient. All of the training EMS Corps students receive leads them up to this moment. EMS Corps members not only learn a new career path, but they can become positive role models in their own communities. Fifteen years ago the Centers for Disease Control and Prevention’s Adverse Childhood Experiences (ACEs) study found that children exposed to traumatic events were more likely to develop mental and behavioral health problems like depression and addiction. They were also more likely to have physical illnesses like heart disease and diabetes. Today, based on that evidence, we are witnessing a health revolution. The same message was echoed in testimony today at the RWJF Commission to Build a Healthier America convening in Washington, D.C., where panelists like Jack Shonkoff of the Harvard Center for the Developing Child emphasized the need for early childhood interventions that focus on building the capabilities of parents to protect their children from high levels of violence and stress, and model resilience. Continuing to develop our understanding of the connection between ACEs and poor health and other social outcomes, and supporting interventions like Child First, Nurse-Family Partnership, and other efforts that work to stabilize fragile families and put children on the path to healthy development will help shape RWJF’s ongoing efforts to foster a vibrant culture of health in communities nationwide.